2018 Elite 60: The Younger, The Better | Servinio's Sports Etc. Coach Rob Beveridge, SBP’s Butch Antonio, Coach Eric Altamirano and Coach Josh Reyes announce this year’s batch of Elite 60. 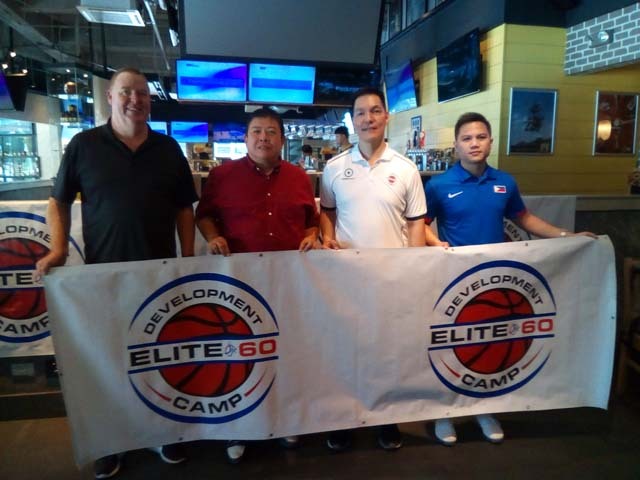 INSPIRED BY the National Junior team’s recent successes, the Elite 60 Development Camp in cooperation with the Samahang Basketbol ng Pilipinas returns for another season to discover talents to serve as materials for future teams. After combing the countryside and overseas Filipino communities, 60 young men aged 16 years and below will be groomed to be the next stars of Philippine Basketball. The 60 players were subjected to an intense four-day training camp inside the Colegio de San Agustin in Makati City beginning May 10. Overseeing the camp veteran will be Coach Eric Altamirano along with Coach Rob Beveridge from Australia and a battery of top local coaches. A series of skills drills and lectures will be held on the first days. The camp will then culminate with a mini tournament and All-Star Game on May 13. Coach Altamirano explained that the age limit was lowered from the previous 18 because most of last year’s campers were already playing for leading high school programs and were already making their mark. A younger age limit will allow faster and better development of the players’ skills. However, it does not end there as a pair of outstanding campers will be sent for further training with the Global Squad in the United States. It will be a one-month all-expense paid trip with possible exposure to collegiate scouts. Last month, the Philippines led by seven-foot wunderkind Kai Sotto managed to qualify for the second time to the FIBA World Under-17 Cup to be held in Argentina starting June 30. The Elite 60 hopes to discover a few players that may be last-minute additions to the team in order to enhance the chances of improving on its 15th Place finish in the United Arab Emirates in 2014. Still, the biggest beneficiary should be the next batch of Under-16 and Under-18 squads in 2020. By then, the success in the Junior levels would slowly be transferred as the young men graduate into the Senior ranks.